Spaying or neutering your companion rabbit can have benefits for both the owner and the rabbit. Unwanted behaviors often develop in animals left intact. In addition, rabbits are at an increased risk of health conditions and decreased life span when not spayed or neutered. Neutering refers to the removal of the reproductive organs, which permanently prevents an animal from breeding. Technically, the term neuter refers to the procedure done in either a male or female animal, though it is commonly used more for the male procedure involving removal of the testicles, also known as castration. The term spay, on the other hand, typically refers to the female procedure in which the ovaries and uterus are removed. While the procedure is safe if you have a veterinarian experienced with rabbits, there can be potential for complications during the procedure. The rabbit must be under general anesthesia during the surgery. Proper pre- and post-operative care is critical to ensure the success of the procedure. Before scheduling your rabbit to be spayed or neutered, discuss the procedure with your veterinarian. Ask the veterinarian how experienced he or she is with rabbit spaying and neutering procedures and what the success rate is. 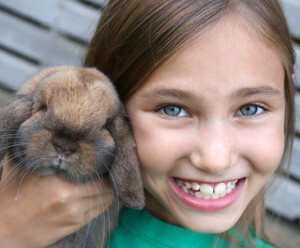 Because of the different anatomy of the rabbit’s reproductive tract compared to other domestic animals, you want to make sure your veterinarian is comfortable with rabbits. Have the vet explain to you how the procedure is performed. Discuss any pre-operative care that needs to be provided to the rabbit. In general, rabbits do not have to be withheld from food before surgery as they cannot vomit, so this risk is not a concern during surgery. Rabbits reach sexual maturity between three and six months depending on the breed. The surgery can be done at this time to prevent accidental pregnancy as well as the hormone surge that can lead to undesirable conditions. Because surgery in rabbits can be riskier, many veterinarians wait until the rabbit is between five and six months of age before spaying or neutering, but it can be done as early as three months in females and after the testicles descend in males. Neutering has proven to be one of the most effective means of reducing the numbers of homeless companion animals that die on the streets or in shelters. Neutering provides a safe and effective way to control reproduction. Rabbits can produce multiple offspring each year, and an increased number of rabbits are ending up in animal shelters or rabbit rescues when their owners can no longer care for them. In addition to reproductive control, the neutering procedures come with several additional benefits as well. Many of the benefits of neutering are behavioral. Sexually intact animals (those that have not been neutered yet) engage in some rather unpleasant behaviors, which decrease or even disappear after neutering. Intact rabbits will engage in mounting behaviors once they reach sexual maturity between three and six months of age. Aggression is higher in intact rabbits, especially females, after sexual maturity. This may be due to the animals fighting for dominance or protecting a nesting area and may result in one rabbit harming or even killing a cage mate. Intact female rabbits are more prone to digging and fur pulling or barbering behaviors as well. A common problem with males and some females is the urine marking or "spraying" behavior typical of intact male rabbits. Sprayed urine often is found on walls or sides of the cage and has a pungent odor. The rabbits may stop or decrease use of their litter box after reaching sexual maturity. After neutering, not only does the activity decrease, but the smell of the rabbit’s urine greatly improves as well. Neutering can also eliminate or reduce the incidence of a number of health problems that can be both difficult and expensive to treat later on in the animal’s life. For female pets, spaying greatly reduces the risk of mammary cancer, which is very common in intact females. The incidence of mammary cancer is influenced by the hormones that surge with an animal’s very first heat. Spaying before the first heat, therefore, greatly reduces this risk. Also, because the ovaries and uterus are no longer present, the risk of cancer and infection (e.g., pyometra) in these organs is completely eliminated. For male rabbits, if there are no testicles, there can be no testicular cancer, and a castrated animal will have a significant decrease in the incidence of prostate disease and associated urinary tract problems. The lifespan of rabbits can be greatly increased with spaying and neutering. Unspayed females have a high risk of dying from uterine cancer between three and five years of age, while spayed rabbits can live between eight and 10 years. While spaying and castration offer these benefits, the procedures are not completely without risk and should be performed only by a licensed veterinarian. General anesthesia is required, and, while generally safe, it always carries some risk, especially in older animals. Other rare but potential risks of any surgery include infection, bleeding problems, and failure of wound healing; again, these risks are decreased in young, healthy animals. The metabolism of neutered animals will change following the procedure; if owners are not careful about providing an appropriate diet and sufficient exercise, these animals may be prone to weight gain. Spaying and neutering provides many behavioral and health benefits to companion rabbits. It drastically increases the life expectancy of the animal and improves the quality of their companionship. To learn more about neutering your companion animal, speak with your veterinarian, local animal shelter, or animal control.